Andalusia may be the poorest region in Spain economically, but it's the richest in terms of culture, places to visit and things to do. It is the most stereotypically Spanish region, with glorious sunshine most of the year; bullfighting, tapas and flamenco at every turn. If you choose just one region to visit in Spain, make this it! This list is in order from most to least interesting places to visit in Andalusia. The Alhambra in Granada. 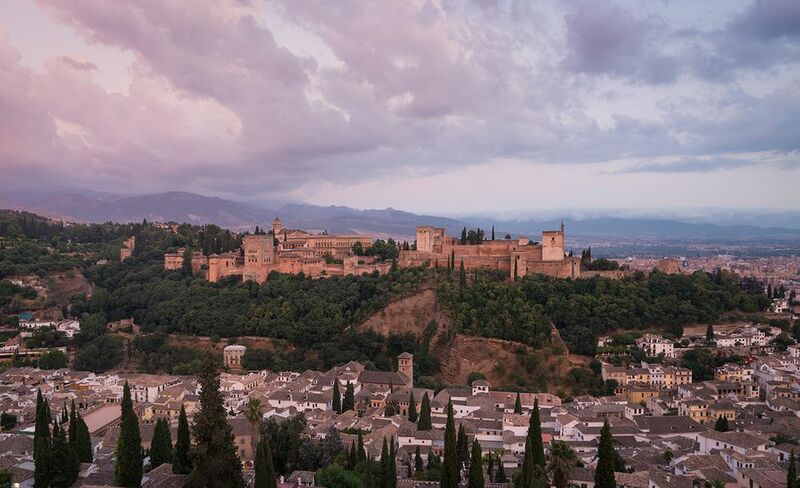 The Alhambra is a Moorish fortress complex, with a number of builds of immense beauty and gardens like you won't see anywhere else. The Cathedral and Alcazar in Seville are the best sights in Seville, and they are side by side. The Cathedral is huge and marries Christian and Moorish designs to spectacular effect. Everyone these days is talking about Osuna and its use as a filming location in Game of Thrones. The Mosque in Cordoba. The biggest mosque in Spain, it is the highlight of any trip to Cordoba. Free tapas in Granada. Granada is famous for its bars, where they serve a morsel of food with every drink. Flamenco in Seville, the home of Spain's most distinctive art form. It isn't all about the dancing - the masterful guitar playing and passionate vocals should stir the emotions. Sherry in Jerez. Jerez invented sherry and a guided tour of one of the many bodegas (wine cellars) is the single most important thing to do in Andalusia. Read more about Sherry Bodegas in Jerez. Bullfighting in Seville, though not to everyone's taste. The wine-growing and ham-producing region of Alpujarras. A short drive from Granada, this mountainous collection of villages is perfect for hiking or sampling the best ham in the country. Fried fish in Cadiz. The 'gaditanos' (inhabitants of Cadiz) invented fried fish long before the British caught on. There are various ways of getting to Andalusia. Here's how to start your trip, depending on where you arrive from. Flying into Madrid Take the high-speed AVE train to Cordoba or on to Seville. Flying into Malaga Take the bus straight from the airport to Granada (or Seville). Coming Over Land from Portugal Take the bus to Seville. Coming by Ferry from Morocco Take the ferry to Tarifa and then a bus to Cadiz or Seville. Arriving in Barcelona Either fly to Seville (Ryanair often has cheap flights) or take the high-speed AVE train. From Madrid, it is just two-and-a-half hours to Seville by high-speed train. Cordoba is a stop on the way to Seville. From Seville, Cordoba is a day trip (or even half-day trip). Read more about Tours of Andalusia from Seville and Tours of Andalusia from Madrid. Two Days: Two days in Seville, with a visit to Cordoba on the way. Or spend both days in Granada. Three Days: Two days in Seville, with a visit to Cordoba on the way, followed by a day in Granada. Four Days: Two days in Seville, with a visit to Cordoba on the way. Then visit Ronda for the day, stay the night, and then travel on to Granada. Five Days: Two days in Seville, with a visit to Cordoba on the way. Do a day trip to Jerez and Cadiz or, better still, visit Cadiz in the daytime and stay in Jerez for the night. Then visit Ronda for the day, stay the night, and then travel on to Granada. Six Days: As above, but with either an extra day in Granada or a visit to Tarifa. Seven Days: Maybe add in a day trip to Tangiers in Morocco? Two Days: Day trip to Granada and a day trip to Ronda (stay the night in Malaga both days). Or visit Seville for both days. Three Days: Pick two out of Seville (spend two days here), Ronda (one day) and Granada (one or two days). Four Days: Two days in Seville, via Ronda for a day, then Granada for a day. Five Days: Two days in Seville, via Ronda. Do a day trip to Jerez and Cadiz or head straight to Granada for your remaining days. Yes, Seville is bigger and probably has more to do, but Granada's unique sights make it the top place to visit on this list. You might want to spend more time in Seville than in Granada, but if you could only choose one place to visit in Andalusia, my choice would be Granada over Seville. The big sight is the Alhambra, the Moorish fortress, palace and gardens complex situated up on the hill overlooking Granada. On the hill opposite the Alhambra are two fantastic barrios to explore. The Albayzín (the spelling varies) is the old Moorish quarter, with narrow winding alleyways flanked by gorgeous whitewashed buildings. You will get great views of the Alhambra from here, which peaks out from between the houses like an elephant playing a terrible game of hide-and-seek. Then there's the Sacromonte area, the old quarter with cave dwellings that people still live in. Some have flamenco shows. And of course, for lunch, you have to check out the city's famous tapas bars. Granada is one of the few cities in Spain where you still get your tapas for free like you're supposed to. Read more about Spain's best cities for TAPAS. Day Trip, Stay The Night or Base Yourself in Granada? Granada as a base for your trip? Depends on how you are arriving in the region. If you are flying into Malaga, Granada is under two hours by bus from Malaga airport (there's a direct bus too). Read more about how to get from Malaga to Granada. It's easy to do Day Trips from Granada, particularly to Seville and Cordoba. However, Seville deserves more than just a day trip. Want a view of you to see in the above picture? Then you have to stay at Rambutan Guest House. They only have a few rooms, including private and dorms. It's one of the best views in Spain at an unbelievably low price. For many, Seville is the best city in Andalusia, and there is no disputing that Seville has a lot more than Granada. Barrio Santa Cruz, Macarena, and Triana are the three top neighborhoods to explore on your trip to Seville. The cathedral, with its Moorish Giralda tower, is a fascinating mix of cultures and architectural styles. Tapas in Seville don't come for free, but they are also generally speaking better quality than in Granada. In fact, Seville is second only to San Sebastian for gourmet tapas in Spain. Day Trip, Stay The Night or Base Yourself in Seville? Seville is an ideal place to base yourself for exploring Andalusia. You have the AVE high-speed train to Cordoba (if you haven't already visited it on the way down from Madrid), good transport connections to Granada and a direct train to both Cadiz and Jerez. For visits to these last two cities, the only place to base yourself would be Seville. What about visiting Seville from Granada? There are day trips and two-day trips to Seville - I'd go with a two-dayer because a day in Seville simply isn't enough. Seville is on the high-speed train line from Madrid - via Cordoba - making it an ideal first or second stop on the way down from the capital. There are even direct high-speed trains from Barcelona now. Seville is also a good first stop in Spain for visitors coming in from Portugal. Ronda is a breathtaking place to visit, with its poor transport connections as the only reason why anyone might decide not to go to the city on a trip to Andalusia. Ronda's location, the bane of anyone trying to get to the city, is also its biggest charm. A remote city built high up over the Tajo gorge is dominated by its majestic bridges and fantastic views. The city also has a good wine museum and some interesting ruins of Moorish baths. Day Trip, Stay The Night or Base Yourself in Ronda? You can't really base yourself in Ronda for a trip to the rest of Andalusia - it would take you too long to get anywhere. For similar reasons, it's best to do a day trip from anywhere but Malaga and the Costa del Sol if you decide to do a guided tour. It's simply too difficult to get to for anyone to want to travel there and back and have time to explore the city in a single day. A guided tour, with the local knowledge that brings, is the way to go for a day trip. If you want to visit by yourself, stay the night. Cordoba, on the high-speed train line from Madrid to Seville, is often people's first experience of Andalusia as they head south from the capital. It makes an excellent start to any trip to southern Spain. Cordoba's main sight is the Mezquita-Cathedral, the former mosque (and once biggest mosque in Europe) and now the Catholic seat of the city. Day Trip, Stay The Night or Base Yourself in Cordoba? If pressed for time, you can see the most important sights of Cordoba in a few hours, making it the perfect stop on the way from Madrid to Seville. If already in Seville, visiting Cordoba for a day is well worth the 45-minute train journey. As the first stop in Andalusia when heading south from Madrid, it also makes sense to base yourself in Cordoba, to minimize your travel time. The main loop of Seville, Cordoba, and Granada takes just as long wherever you start from, but you haven't had to travel as far from Madrid to start the journey. Cadiz is famous for its fried fish and the microclimate its peninsula location affords it. Cadiz is a great place to sample the famous fried fish of Andalusia. It is also just outside the sherry triangle, so lots of bars also serve local wines too. The old town area is beautiful, especially the La Viña neighborhood (see the picture above). Day Trip, Stay The Night or Base Yourself in Cadiz? Cadiz is lovely, a day trip is probably enough. A large part of that is because the restaurants almost exclusively serve fried fish. Two meals in one day where all you eat is fish is one thing, but more than that? The main reason to stay longer is if you want to take advantage of the beaches. You can visit Cadiz as a day trip from Seville, but you might instead prefer to stay in Jerez and visit Cadiz from there, in order to visit the excellent tabanco sherry bars. Jerez, on the train line from Seville to Cadiz, is the birthplace of sherry. Jerez is all about the sherry. And it's just not because the wine itself is nice - it's also about where you drink it: in the fantastic vintage tabanco sherry bars. And how to spend the daytime? Visit a sherry bodega and learn the production process or visit the famous horse shows of Jerez. Day Trip, Stay The Night or Base Yourself in Jerez? You can see everything you need to see in Jerez in a day, but you might want to stay a night to enjoy the bar scene. If you don't have any interest in the daytime sights of Jerez, head over to Cadiz for a fried fish lunch and walk in the old town. Tarifa is mainland Spain's most southerly town and almost touches Morocco. It is the point where the Atlantic and Mediterranean meet. Tarifa is all about the water: particularly, watersports, visits to Morocco and whale watching. It's not the only place you can cross to Morocco, but it has the quickest crossing and it's the nicest place to depart from. Day Trip, Stay The Night or Base Yourself in Tarifa? Tarifa isn't convenient for exploring the rest of Andalusia from. How long you want to spend here depends on what you want to do: you could stay a month learning to windsurf, or just pass through on the way to Morocco. No, Spain hasn't annexed Tangiers, but as it's just half an hour by boat from Tarifa, it may as well be in Andalusia in terms of your trip planning. If you are visiting Seville, Ronda, Cadiz, Jerez or Tarifa, Tangiers is certainly worth a visit. Hopping over to Tangiers from Andalusia is easy to way to not only add in another country but another continent to your vacation. But box ticking shouldn't be your main reason for visiting somewhere. Tangiers, though not Morocco's most interesting cities (Fez and Marrakech take that prize), is a city with a vast amount of heritage. It's cleaned up its act in recent years and how has a fine souk, much like the ones you'd see in other cities in Morocco. Day Trip, Stay The Night or Base Yourself in Tangiers? To be honest, the only reason to visit Tangiers is if you can only spare a day in Morocco. An overnight trip might be worth it, but any more days than that and it's best to head further into Morocco, either over land or by flying to Fez or Marrakech. There are loads of guided tours of Morocco that depart from Spain. Or travel under your own steam by ferry. Malaga has Andalusia's biggest airport and so is a very common first stop for visitors to the region. But should they really stick around? Malaga is famous for its fried fish, which is not as good as that of Cadiz. It makes its own sweet wine, which isn't as interesting as that of Jerez. Its Alcazaba has nothing on the Alhambra in Granada or the Alcazar in Seville. Its beaches are very average - the rest of the Costa del Sol and Costa de Almeria have nicer sand. Its nightlife is good for the area - it is the biggest city on the south coast, after all, but doesn't have anything on Madrid or Barcelona. So what does Malaga have going for it? It has the best weather for any city in Spain (Seville is too hot, everywhere else has too many cold days), which means virtually year-round eating and drinking outside on terrazas. It's just a shame that these terrazas are in a very commercial part of town, with clothing stores and frozen-yogurt outlets all around you. If you have three days in Spain and want sun, food, and nightlife, Malaga is perhaps your best bet on the mainland. But if you want more than that, you should go anywhere else. Day Trip, Stay The Night or Base Yourself in Malaga? None of the above. Take the bus straight from the airport to Seville or Granada. What you do have here, though, is the best network of tours for any city in the region. There is a high-speed AVE train from Madrid to Malaga, but apart from that, you'll probably need to take a bus.